Military operations between France and the Axis powers, that is, Ger­many and Italy, ended on June 25, 1940. Three and a half weeks later, on this date in 1940 in Berlin, vic­to­rious Wehr­macht troops marched through the Branden­burg Gate for the first time since Kaiser Wilhelm I’s victory over France in the Franco-Prussian war in 1871. Adolf Hitler handed out ranks and decora­tions to the grossly corpu­lent Air Marshal Her­mann Goering, now pro­moted to the rank of Reichs­marshall, as well as to other generals who had served in the Battle of France (May 14 to June 20, 1940). Speaking before the august assem­bly, Hitler held out an olive branch to Great Britain, which, like defeated France, had declared war on Ger­many on Septem­ber 3 the year before. The incor­ri­gible aggres­sor told the new British Prime Minis­ter, Winston Chur­chill, in his speech that he did not wish to con­tinue the mili­tary struggle against the lone hold­out against Nazi domi­na­tion in Europe. “My con­science dictates that I should send a new appeal to rea­son to Eng­land,” he stated. “I think I can do this because I am not a defeated enemy who is begging but a victor who has nothing to ask. I do not wish for any rea­son to con­tinue this struggle.” The next day Hitler received the British response: Ger­many could only have peace if it evacu­ated all the terri­tories it had occu­pied since the out­break of war, restored the free­doms it had trampled on, and gave guaran­tees for a peace­ful future. 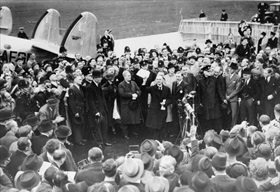 This last require­ment seemed an odd one, for Chur­chill’s pred­e­ces­sor, Neville Cham­ber­lain (in office from May 1937 to May 1940), held aloft a memo­ran­dum that he and Hitler had signed, waving it to a cheering crowd upon his return from Munich at the end of Septem­ber 1938. “To assure the peace of Europe,” the two leaders “resolved that the meth­od of consul­ta­tion shall be the meth­od adopted to deal with . . . ques­tions that may con­cern our two coun­tries.” The Munich Agree­ment, the signa­ture achieve­ment of his ad­min­is­tra­tion, Cham­ber­lain assured an anxious world, had pro­duced “peace with honor,” “peace for our time.” On sensing a change of atti­tude in Brit­ain’s new and feisty prime minis­ter, a dis­appointed Hitler retired to the Berg­hof, his Bava­rian moun­tain retreat on the Ober­salz­berg near Berchtes­gaden, wondering why his peace over­ture had fallen on stone cold ears. 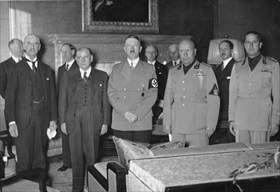 Left: British Prime Minister Neville Cham­ber­lain, French Prime Minis­ter Édouard Dala­dier, Ger­man Chan­cellor Adolf Hitler, Ital­ian Prime Minis­ter Benito Mus­so­lini, and Ital­ian Foreign Minis­ter Gale­azzo Ciano pic­tured (left to right) before signing the Munich Agree­ment shortly after 1 a.m., Septem­ber 30, 1938. The “Czecho­slo­va­kian prob­lem,” as Cham­ber­lain framed the dis­pute between Ger­many and its south­ern neighbor, was resolved by detaching Czecho­slo­va­kia’s mostly German-speaking Sude­ten­land and handing it over to Ger­many. The Czecho­slovak govern­ment in Prague objected to the agree­ment reached by Europe’s Big Four, but agreed to its terms when in­formed (essen­tially black­mailed) that should a war break out Czecho­slo­va­kia would be held respon­sible. The Munich Agree­ment would culminate six months later in Hitler’s takeover of what was left of Czechoslovakia.